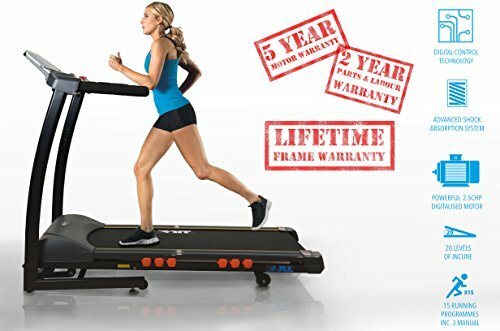 Summary: As long as the huge discount available at the time of writing stays in place, you have the opportunity to grab a truly high-end home treadmill at a mid-range price. This has a spec which most treadmill users dream of. For me the 20 level automatic incline is the clincher. If you have used a manual incline machine then you will know what I mean. Having this adds a new level to the programs available through the entertainment / phone compatible console. This is unsurprisingly a best-selling model, and the feedback is excellent. Check out the full spec and current amazon.co.uk discount on the dedicated product page. 0.3 km/h - 16 km/h speed range, 0 - 20 levels incline range. 5" LCD Monitor displays: time, speed, distance, heart rate, calories. 15 running programmes, the first 3 programs you have the option to customise yourself. 16 point cushion deck absorption system. When you first use this treadmill you are in for a surprise. Starting from the upright position, the running surface automatically lowers on a hydraulic arm. This is called ‘soft drop technology’, a fancy way of saying it folds and unfolds by itself. This is a big treadmill, with a comfortable and wide running surface. Where it really stands out is in the electronics and features. The top speed is 16 km/ hour (enough for even the fastest runners to be challenged over anything but short distances). There are 20 levels of incline, which can be changed electronically while you are running. This is an important factor in the intensity and variety of the many preset programs in the next-generation LED console. Running is made smoother with a 16 point cushioned setup (I’m not exactly sure what this involves, though feedback on the comfort has been very positive). Two-man delivery and a two year warranty come as standard (5 years for the motor). Users up to 120 kg (almost 19 stone) can use this treadmill. The JLL S300 has built in speakers and is compatible with phones and ipods via a USB interface. The makers claim that you can replicate any terrain using the programmable console (using a mix of speed and incline). There are 3 separate custom programs possible, along with 15 preset ones. You can also run in conjunction with the heart rate monitor – the intensity of your run will be adjusted according to your pulse. The only negatives I could find in the reviews come from a couple of buyers who experienced disconnected wires – disabling the controls from the console. This will be covered under the 2 year guarantee – though obviously was an issue for these users. Otherwise, feedback is about as good as you will find for any piece of home fitness equipment. Comments included terms like ‘commercial quality’ and the word ‘value’ came up several times. When you consider that without the amazon.co.uk discount this machine would be firmly in the upper price range, it is not too surprising that many people are happy with their purchase. A couple of taller runners also commented that they were comfortable using this machine. The JLL S300 certainly has an amazing spec. Not only do you get computer controlled automatic incline and a programmable interface – there is entertainment capability built in as well. At the full price this would be fair value – with the huge discount (* usual disclaimer, at the time of writing) the JLL S300 is an absolute steal. Check the product page over at amazon.co.uk now for the full spec and latest discount.